The Ring of Kerry, in County Kerry, is one of Ireland’s most scenic drives. This 180 km well-established tourist trail around the Iveragh Peninsula takes visitors through dramatic coastal and mountain scenery, quaint little towns and past slate-roofed fishing villages. The Ring of Kerry is a circular route, so if you’re driving, you can start your tour from any of the towns and villages along the route. We were on a coach tour and as the roads are narrow, all tour buses know to travel in an anti-clockwise direction. In fact, the Ring of Kerry tourism people do advise motorists to drive in the counter-clockwise direction. We started from Killarney and travelled along the banks of the River Laune towards the picturesque village of Glenbeigh, a popular holiday destination for families. Glenbeigh is famous for its Kerry Bog Village with re-created 18th century thatched cottages, but on our tour, the company thought that we would enjoy a traditional Irish Coffee more. So, at 10.00 in the morning we pulled into the Red Fox Inn, a popular and quaint little village pub, well-known for its Irish coffee. Maybe there’s logic to this madness and the Irish Coffee is intended to improve the day for those who are a little grumpy from the early morning start. The next town is Caherciveen, the main town on the peninsula and home to the Old Barracks Heritage Centre, located in the former Royal Irish Constabulary Barracks. From here on the cliff section of the road provides spectacular views of the Blasket Islands and the Dingle Peninsula. We stayed on the N70 to Waterville, home to Ireland’s world famous golf links. If you are travelling by car, you can go off onto the smaller road to the tip of the peninsula. Skirting Ballinskelligs Bay, our next photo opportunity shoot was at Coomakista Pass. The views over the Kenmare River, Scariff and Deenish Islands are spectacular but we only get to enjoy it from the coach. The skies were grey, but it added an air of mystery to the place. Points of interest around the lower south-western tip of the peninsula include Derrynane House, the home of Daniel O’Connell and Derrynane National Park. There are some nature trails here and, we are told, one of Ireland’s most outstanding beaches. Given the grey skies and rather cold summer temperature, we’ll take their word for it! Staigue Fort at Castlecove, the next sightseeing attraction, is one of the largest and finest examples of a circular stone fort in Ireland, but by now we were racing for Sneem as an early lunch was awaiting at the Bank House for those who wanted to enjoy some local hospitality. Sneem is a pretty little village that relies on tourism for its economy. It was raining when we visited, but what Sneem lacked in sunshine on that day, it more than made up with the colourful houses and buildings. After lunch, we continued east past the heritage town of Kenmare. From Kenmare, the road takes a northbound direction to Killarney via Moll’s Gap and Ladies View and then to the Lakes of Killarney to enjoy the spectacular views. Certainly a better way to explore the Ring of Kerry is by car as you’ll get to stop and visit the towns and villages, explore Ireland’s ancient heritage and have time to soak in the magnificent views. But beggars can’t be choosers and our escorted tour of the Ring of Kerry gave us a good perspective of this scenic route. 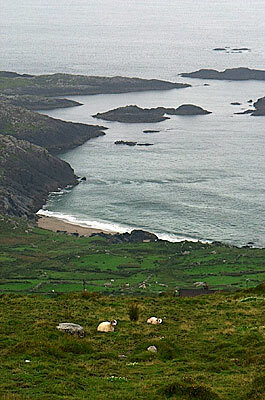 See our somewhat grey photos of the Ring of Kerry here. I was disappointed in the Ring of Kerry. It was overly commercialized and the tour I was on only capitalized on that. I found the Dingle Peninsula much more beautiful, easy to navigate in my rental car and less touristy. just a quick update on whats new in Waterville as your lads come here often with visitors. We have a new heritage center opening up in the the fabulous old church here in the village.